My grandmother used to buy Odlums flour by the 10-stone bag and baked some 50,000+ loaves of bread in her lifetime – not because she ran a bakery, but because everyone baked their own bread every day in the rural farming village where she lived. So in the vague hope that some of the bread-making genes might have passed on to me, I asked my Mum for the soda bread recipe that both she and my grandmother used. One of the ingredients was buttermilk, but we had to wait overnight for Al Amin to get some delivered (thanks to Spice Gate – who also sell it – for pointing me in Al Amin’s direction as they were out of stock), so we decided to make a traditional Danish bloomer first. 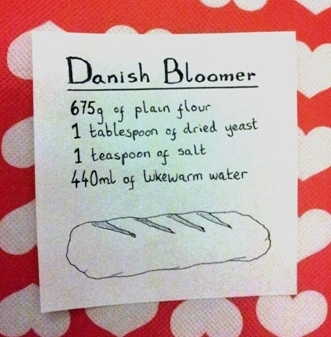 I had wondered what exactly a Danish bloomer was, though – as I was reliably informed by the half-Danish Mr Mill Road – bloomers originated in Denmark. So armed with our recipe (see left) we set about adding the yeast to 100 ml of the water and giving it a good mix. We then sieved the flour into a large bowl and added the salt, before making a well in the centre. The yeast blend was added and also the remaining 340ml of water, before combining with a wooden spoon. After a couple of minutes it was time to get our hands dirty and we moulded it until a dough consistency was formed. We then dusted the worktop with some plain flour before kneading it for a good ten minutes; and although it had felt a little sticky at first, it soon reached the right texture as we began kneading. I could attempt to explain how to knead dough, but Paul Holloywood does it much better in this one-minute video. When we removed the dough from the cupboard we put it in a low flat baking tin and shaped into a bloomer shape, before making five diagonal cuts across the middle with a knife. At this point, a friend popped over for an unexpected cuppa and it fortuitously transpired that in a former life he had been a baker! He explained that resting it in a very warm place for about fifteen minutes before putting it in the oven would help, and so we sat the baking tray in the closed grill area directly above the oven (we had already preheated the oven to gas mark 8 about ten minutes earlier). After the required fifteen minutes we removed it and the outside of the dough was just beginning to change in texture. It went straight in the oven for about twenty five minutes and when we removed it the outer edges were nice and crispy, and when we tapped the base of the bread it sounded hollow (another top tip from our baker friend). The smell of our freshly baked bread was amazing and after letting the bread sit for about half an hour to cool down, it was time to cut our inaugural slice… the texture was perfect and we enjoyed a couple of slices with just butter. 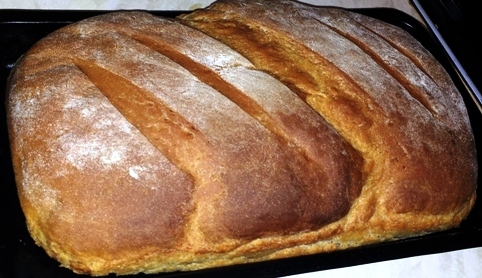 The loaf kept well and remained nice and soft in the middle for the three days it took us to eat it all. 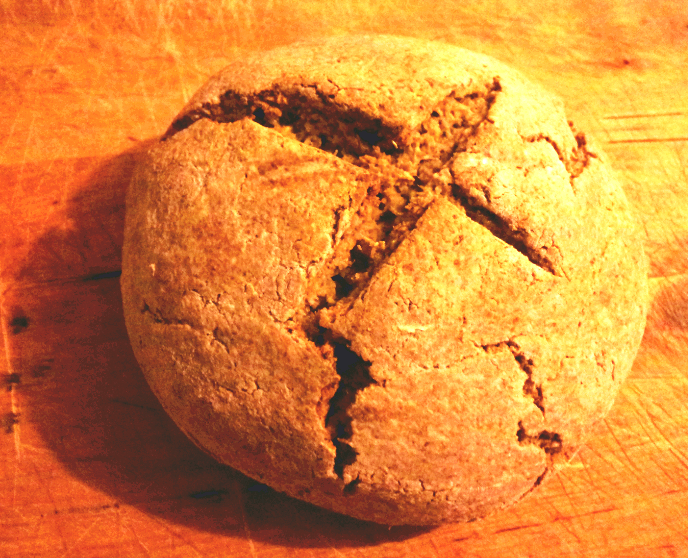 Next on our agenda was the soda bread. I picked up the buttermilk from Al Amin the following day and we set about preparing our ingredients. 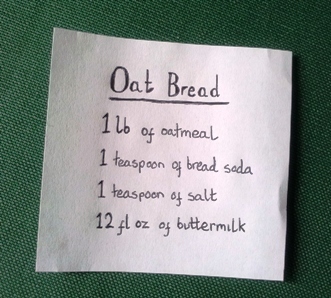 Although the recipe that we had used flour and a little oatmeal, for some reason we decided to experiment and use just oatmeal (no flour), so I guess we were making oat bread/cake… We spent a good half hour using a rolling pin to crush the oatmeal into small flour-like grains (another bicep workout!) before putting in a large mixing bowl with the bread soda (which I bought at Arjuna) and salt. We then added the buttermilk – which smelt a little like yoghurt and was thicker in texture than we had expected – and mixed thoroughly to form a dough. As we weren’t using yeast, there was no need to knead the dough or let it rise/prove, so we just rolled it on a well floured worktop for a minute or two in order to shape it into a ball. The oven was preheated to gas mark 6. We then placed the oaty dough onto a baking tray and cut a traditional cross in the centre, before putting in the warmed grill area for fifteen minutes (as with our bloomer). It was now ready to go in to the oven. We kept checking on it and after about forty minutes it looked ready, so we removed and did the hollow base test. We then left to cool on a wire rack and waited until the following morning before trying some. It was rather heavy and not at all like soda bread, but neverthless tasty – even more so when lightly toasted with butter and honey.